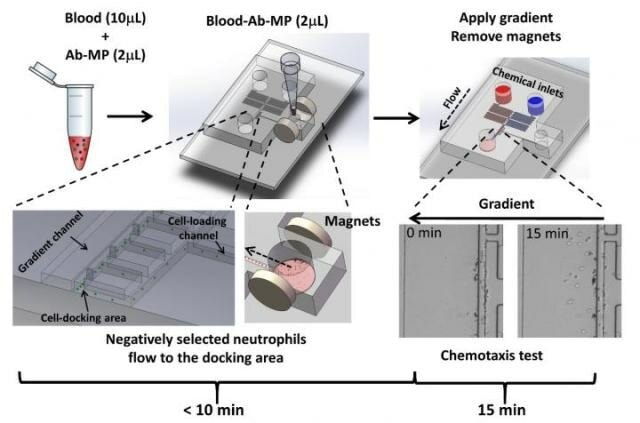 A team of researchers from the University of Manitoba in collaboration with local clinical scientists in Winnipeg, Canada, have developed a new method for rapid neutrophil chemotaxis test directly from a small drop of whole blood using a microfluidic system. Although many microfluidic devices have been developed for quantitative immune cell migration studies and relevant clinical applications, cell isolation from blood in most studies still relied on specialized facilities. The process is labor-intensive, time-consuming, requires specialized skills, and often causes cell pre-activation. Direct isolation of specific blood cell types of interest from whole blood followed by cell migration experiment all on the same microfluidic device is highly desirable. In this direction, the present method provides easy-to-use microfluidic devices for efficient on-chip magnetic negative neutrophil isolation from a small drop of whole blood using reagents from a new commercial kit followed by neutrophil chemotaxis assay all on the same device. Furthermore, the integrated standalone microfluidic gradient generator and cell-docking structure improve the control of cell migration experiment, which enables easier and more accurate chemotaxis analysis. The whole experiment can be done in less than 25 minutes. The method was successfully validated by testing neutrophil chemotaxis to both purified chemoattractant (i.e. fMLP) and clinical samples (sputum from patients with Chronic Obstructive Pulmonary Disease). This report appears in a forthcoming issue of the journal TECHNOLOGY. "The traditional cell preparation method significantly limits the efficiency of neutrophil chemotaxis experiment and makes it difficult to run the test in clinical settings. The developed all-on-chip method effectively removed this bottleneck. Furthermore, the integrated cell-docking feature permits cell pre-alignment in the device before chemotaxis experiment, and therefore it can provide instant chemotaxis test result at the end of the experiment based on the final positions of the cells," says Professor Francis Lin in the Department of Physics and Astronomy at the University of Manitoba and Principal Investigator of this study. "One of the most attractive features of our technology is the minimal requirement for assay operation, which is very important for its practical use in life science labs and clinical labs. In addition to neutrophils that we used for proof-of-concept, there is a growing potential to extend our approach to test the migration of other cell types from blood upon availability of the corresponding magnetic cell isolation kits." says Dr. Jiandong Wu, a MITACS Postdoc Fellow in the Lin lab and the leading author of this paper. "The technology can be broadly applied" added by Professor Lin, "We plan to further apply it to study the migration of different immune cell types, cancer cells and stem cells. We already demonstrated that this approach can be effectively used for testing clinical COPD samples. We are confident that this approach can be generally useful for research and clinical applications in other relevant diseases. We will further develop this technology and aim to establish broad collaborations with cell migration researchers and industrial partners to enhance the applicability of this technology."